"Stay" is a song by UK-based pop act Shakespears Sister, released by London Records in January 1992 as the second single from their album Hormonally Yours. Upon release, the single became a global smash hit becoming the duo's first and only No. 1 single in numerous territories, including the UK, where it topped the UK Singles Chart for eight consecutive weeks; the longest UK No. 1 reign for any all-female band, and was the fourth biggest selling single of 1992. The single also held the No. 1 position in band member Siobhan Fahey's birthplace, Ireland, for six weeks, and it was a transatlantic hit reaching No. 4 on the Billboard Hot 100 in the US. At the 1993 Brit Awards "Stay" won the award for British Video of the Year. In November 2010, The X Factor contestant Cher Lloyd performed the song on series 7 of the show. Following this, the original version re-entered the UK, Ireland and the European Hot 100 Singles charts. The song originally sold 490,000 copies in the UK by the end of 1992 which was a year that saw low single sales, as of February 2012 it has sold over 600,000 copies (the threshold for a Platinum certification in the UK). As well as being used on The X Factor, the song has also been featured on Britain's Got Talent, Dancing on Ice, Strictly Come Dancing, The Voice UK, The Voice of Ireland and The X Factor New Zealand. 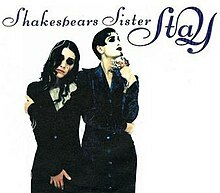 "Stay" was the only Shakespears Sister song that featured Siobhan Fahey less prominently on vocals than Marcella Detroit, with Detroit singing the verses and lead chorus and Fahey singing the song's dramatic bridge. Detroit is noted for singing in whistle register before the last chorus of the song, going up to a high F (F6). The piano, synth and bass guitar were performed by Ian Maidman, and the drums by Steve Ferrera, both musicians whose contributions featured throughout the 'Hormonally Yours' album. Billboard wrote about the song: "British female duo scored a No. 1 pop smash throughout Europe and the U.K. with this complex modern-pop tune. Vocal tradeoff between Marcella Detroit and former member of Bananarama Siobhan Fahey is both intense and dramatic." Sophie Muller directed the promo video for the single, the concept of which was inspired by the film Cat-Women of the Moon. The video featured Detroit and Fahey fighting over a comatose man (played by Dave Evans, former boyfriend of Fahey's Bananarama bandmate Keren Woodward). The video won Best Video at the 1993 Music Week Awards and Brit Awards, and was the subject of a spoof by comedians French & Saunders. The epic promo was featured in the Top 100 Music Videos of all time by Channel 4. In some rare versions the beginning quotes a variation of the opening of William Shakespeare's Macbeth: The original quote of the play ("When shall we three meet again") is changed to "When shall we two meet again", referring to the story told in the video. The video starts with a view of a calm night sky. A shooting star passes over a full moon and the song begins. The camera pans back into a hospital room. Detroit is seen tending to her lover, played by Evans, who is in a coma and on the verge of death, while singing to him not to leave her. At the bridge of the song, a portal opens and the angel of death, played by Fahey, appears at the top of a staircase, wearing a sparkling catsuit. She dances around in front of a bright light whilst mocking Detroit with a verse that she cannot save her lover and the best she can hope for is to return safely to her own world. Detroit tries her best to wake the man up, while Death slowly makes her way down the stairs to claim his soul. The two women begin fighting over the man, making it literally and figuratively a fight between life (Detroit) and death (Fahey). During their struggle, the man finally wakes up, he and Detroit embrace while Death, having failed to seduce him into her realm, walks away in disgust and goes back up the staircase to the light, presumably being the stairway to Heaven. Bananarama[circular reference] (comprising Siobhan Fahey with original Bananarama members Sara Dallin and Keren Woodward) performed the song live on their "Bananarama: Original Line Up Tour" in 2017. A live recording of this song was also included on their 2017 live album, "Bananarama: Live At The London Eventim Hammersmith Apollo". Cher Lloyd performed the song on the Halloween episode of The X Factor series 7 in 2010. The Shakespears Sister original re-entered the UK Singles Chart at No.12 and the Irish Singles Chart at No.10. Il Divo recorded a version of the song for their 2011 album, Wicked Game. Anders / Fahrenkrog recorded a version of the song for their 2011 album, Two. Delta Goodrem recorded a version of the song as a B-side for her 2014 single cover version of "Love... Thy Will Be Done". Blutengel recorded a version on their 2004 album Demon Kiss, and 2015 album Omen. Sweetbox recorded a version on their 2002 album Jade. Cradle of Filth recorded a version on their 2006 album Thornography. Ane Brun recorded a version on her 2017 album Leave Me Breathless. Featured in the 2000s paranormal television series Ghost Whisperer, season 4, episode 13 ("Body of Water"). ^ Roberts, David (2006). British Hit Singles & Albums (19th ed.). London: Guinness World Records Limited. pp. 537–9. ISBN 1-904994-10-5. ^ a b "Charstats - Shakespear's Sister". chartstats.com. Archived from the original on 10 January 2013. Retrieved 3 December 2012. ^ "1993". Brits.co.uk. 16 February 1993. Retrieved 30 March 2014. ^ "Shakespears Sister's Stay turns 20". ^ "Billboard: Single Reviews" (PDF). Billboard. Retrieved 24 January 2018. ^ "Marcy & Siobhan about STAY". YouTube. 7 June 2008. Retrieved 30 March 2014. ^ "Explore". Channel 4. Retrieved 30 March 2014. ^ "Shakespears Sister 'Stay'". YouTube. 30 November 2006. Retrieved 9 May 2014. ^ "Shakespears Sister 'Stay'". YouTube. 11 November 2009. Retrieved 30 March 2014. ^ "Siobhan Fahey - Bad Blood - Discogs". Discogs.com. Retrieved 1 December 2012. ^ "Australian Charts > Shakespears Sister - Stay". australian-charts.com. Retrieved 3 December 2012. ^ "Austrian Charts > Shakespears Sister - Stay". austrian-charts.at. Retrieved 3 December 2012. ^ "Ultratop.be – Shakespears Sister – Stay" (in Dutch). Ultratop 50. ^ "French Charts > Shakespears Sister - Stay". lescharts.com. Retrieved 3 December 2012. ^ "GER Charts > Shakespears Sister". charts.de. Retrieved 7 December 2012. ^ "Rish Charts > Shakespears Sister". irishcharts.de. Retrieved 3 December 2012. ^ "Dutch Charts > Shakespears Sister - Stay". dutchcharts.nl. Retrieved 3 December 2012. ^ "New Zealand Charts > Shakespears Sister - Stay". charts.org.nz. Retrieved 3 December 2012. ^ "Norwegian Charts > Shakespears Sister - Stay". norwegiancharts.com. Retrieved 3 December 2012. ^ "Swedish Charts > Shakespears Sister - Stay". swedishcharts.com. Retrieved 3 December 2012. ^ "Swiss Charts > Shakespears Sister - Stay". hitparade.ch. Retrieved 3 December 2012. ^ a b c d "Shakespear's Sister - Allmusic discography". allmusic. Retrieved 3 December 2012. ^ "European Hot 100". billboard. Retrieved 3 December 2012. ^ "Chart Track: Week 43, 2010". Irish Singles Chart. ^ "Billboard Top 100 - 1992". Archived from the original on 17 January 2010. Retrieved 30 July 2010. ^ "BPI Awards Search". Archived from the original on 11 May 2011. Retrieved 3 December 2012. ^ "British single certifications – Shakespears Sister – Stay". British Phonographic Industry. Select singles in the Format field. Select Gold in the Certification field. Type Stay in the "Search BPI Awards" field and then press Enter. ^ "SEARCHRIAA – Gold & Platinum: Shakespears Sister". Recording Industry Association of America. Archived from the original on 26 June 2007. Retrieved 3 December 2012. ^ "American single certifications – Shakespears Sister – Stay". Recording Industry Association of America. If necessary, click Advanced, then click Format, then select Single, then click SEARCH. This page was last edited on 9 March 2019, at 19:34 (UTC).